Produced by the Reliant. 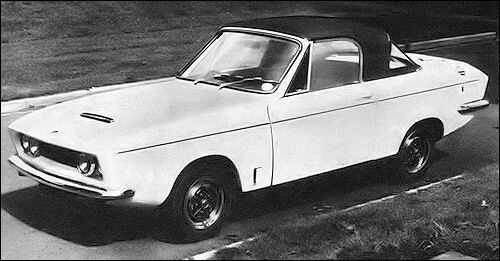 Group, the Bond Equipe 2-litre uses the separate chassis and six-cylinder engine of the Triumph Vitesse. It is a 100 m.p.h.-plus car, available with fastback coupé or convertible bodywork in glas-fibre. With 2+2 seating, the Equipe 2-Litre is for the man who likes something different but based on well-proven and easily-serviced components. Suspension is all-independent and the steering and suspension joints are grease-packed for life. The long nose lifts up complete for inspection and servicing of engine and front suspension. The Bug is a two-seater sports three-wheeler with a glass fibre body and a canopy hinged forwards of the windscreen. 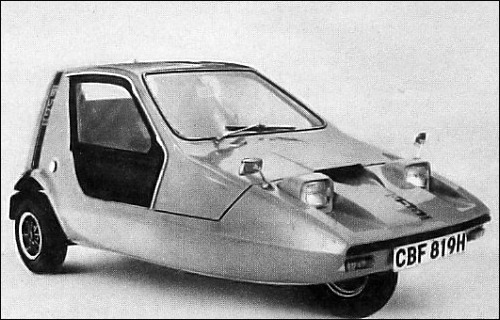 The body is mounted onto a pressed steel, box section chassis with tubular braced cross members.The forward-mounted 700cc Reliant engine drive the rear wheels through a 4 speed gearbox with reverse. The length is 9' 2", width 4' 7" and height 4' 2". The Bug 700 is the base model without any refinements or luxuries. The canopy have to be hold open with a simple prop arrangement and sidescreens are not fitted. The 700E is a deluxe version of the 700 with sidescreens, a heater, a telescopic canopy damper, canopy lock, polished hub caps, chrome glazing rubber trim, drivers sun visor and an interior light. The Bug 700ES have the same specification as the 700E but with a higher compression engine, Decathlon low profile tyres, spare wheel, rubber front bumper, wing mirrors, mud flaps, headrests, side and centre seat supports, twin horns, "Formula 1" steering wheel, etc. Seat belts could be ordered for all models for an extra cost whilst Aluminium cast wheels are available for all versions as a factory fitted cost option. The car is only available in tangerine with black interior trim.